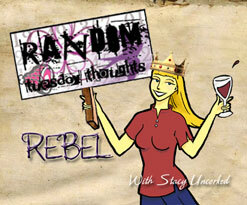 Is it really Random Tuesday already? Old Church Recipe Book - Elephant Stew (seriously it calls for an entire elephant), in addition to the humor, this blog has some brilliant recipes all created by young family committed to getting through grad school with no debt. It's motivating and inspirational! This article from Forbes suggest having ADD might be an advantage to a CEO, the first page is a little random, the article gets better in pages 2-3. This article from INC. gives a list of 10 things to ask yourself at the end of a day to gauge success. 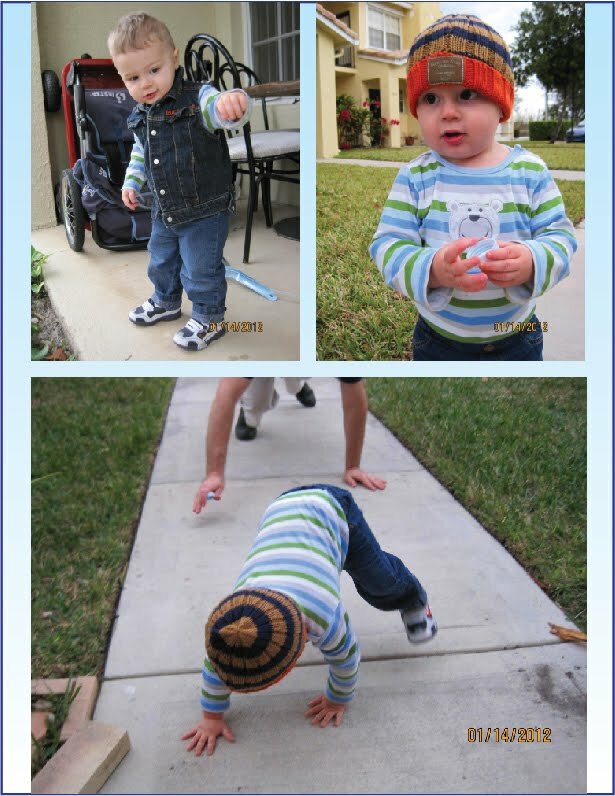 Sam turned 18mo on Sunday, in his check up he now weighs a hefty 28.6lbs! Charlotte has gone to Texas for two weeks to visit her grandparents, she displayed an astonishing amount of maturity in her decision to go, help pack and decorate her suitcase and went to the airport without a fuss. I understand she's behaving beautifully while there! We have started sending her cards in the mail so she will start getting them on Thursday. Contractions about once an hour, annoying (no worries, just braxton hicks, known as false labor or practice contractions). Exhausted by 8pm, more like brain dead! Failed 1st Glucose test last week, have to return for 3 hour test tomorrow, sad. That's all I have for today! Hope y'all have a great Tuesday!! This past weekend I've been fascinated with Pinterest, to the point that I burned hot chocolate on the stove for 1.5 hours! It's the messages people are pinning that has piqued my curiosity. Some have messages of hope and inspiration, others have very negative words filled with self-gratitude. I realized how much words can quickly brand us as a positive or negative person and it made me want to fill my online spaces with positive words. 261 - Inspiration boards, they give us pause and time to reflect on good things in the swirl of chaos a day can bring. 262 - Sunday family time, a day designated to spend time with our children and show them amazing things. 264 - For social media, which allows us to quickly share family moments with our extended families in Maryland and Texas. 265 - For my husband who made sure I rested all day yesterday. Today is Sam's 18mo birthday! Okay I know it's a little silly to celebrate 6mo b-day's but this is the only one we celebrate. There is just something really cool and nerve racking about 18mo that takes a toddler from bumbling to amazing climbing abilities small child. Call our house any time during the day and you are bound to hear another parent in the background screaming at Sam to come back (as he high tails it to the road) or stop whatever destructive behavior he's engaged in (downward dog on chair with head pointed precariously to the edge?!!). Just yesterday I found myself screeching for him to NOT GRAB the tray of oranges off the table and husband commented that it was a little over the top. It's true, the more he reaches the higher our volume gets in an attempt to reach that determined little brain of his. Sigh! So I apologize in advance if you've called and heard one of us screeching in the background. We celebrated 18mo with a trip to Cracker Barrel for Sweet Potato pancakes loaded with brown sugar/butter (good thing I'm pregnant!!!) 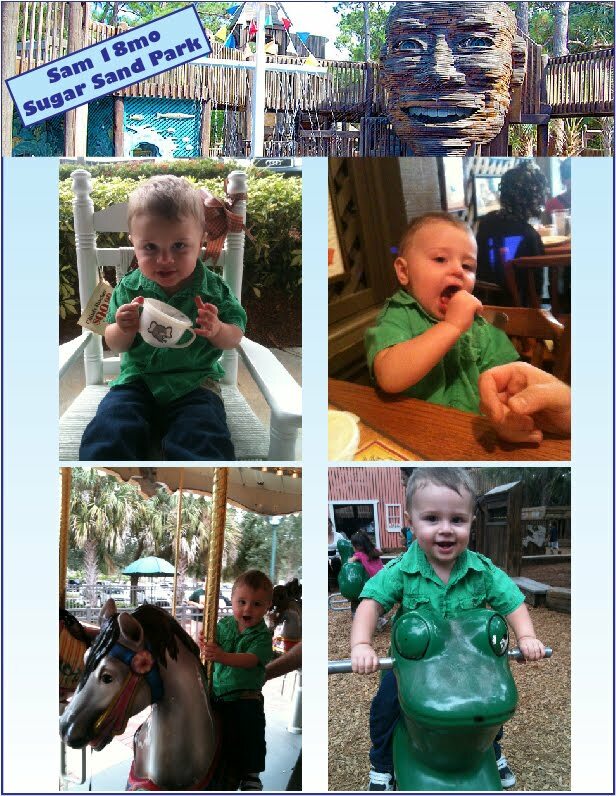 followed by a trip to the epic Sugar Sand Park in Boca Raton, FL which comes with a fantastic carousel and giant wooden fort with enough steps to preoccupy our determined climber. 1. What events from your past have helped form the professional you are today? 2. In looking through old journals, do you still recognize the person you were in college? I spent the past weekend going through journals and sketch books in an attempt to clean up our overflowing garage. At first I only intended to downsize because we really want to minimize our clutter but then I got pulled into the journals and sketch books that had tons of notes from college. It was there I found ideas and dreams from 12 years ago that became the basis for my thought process as a professional. I found notes from conferences that had inspired me but most importantly I found a passion for learning and advancing myself into a creative profession. I'm really glad I kept these sketch books and journals. My college self is an inspiration to me today to stay passionate about my career and seek the jobs and positions that will best bring out that passion for learning and advancement. I'm looking forward to your stories, please link below and I'll be sure and stop by later this week. I've reached the 3rd trimester which comes complete with more exhaustion, more bathroom breaks and the feeling that my uterus is about to fall out after a weekend of handling kids, including almost 18mo who weighs 28lbs. My doctor tells me to stop picking him up and coincidentally he's suddenly wanting picked up more and stomps his tiny feet in frustration when I try to get on his level and get a hug. He wants UP. He wants my additional height to see things in the room. He wants entertainment and being on his level is not fun. I've been here before with Charlotte when I was pregnant with Sam so we will get through this. Now I'm off to work early so I can fit in a yoga class! Hope you all have a great Tuesday! This year, we are trying to plan something for every Sunday to do as a family. We write it on the calendar and spend the prior week getting the kids pumped up. Today was Train Day! Our local Tradewinds park runs a little train every 3rd Sunday of the month and we've been looking forward to this since discovering the park in December of last year. Charlotte was just recovering from her 4 day fever but since she woke up without any temperature we decided to still do train day. Upon arrival to the ticket counter I was told that I could not ride the train because I was pregnant. Sounds silly right? But we are familiar with the strict park rangers in Florida, last year they wouldn't let our family of 4 ride in a canoe together because the rules stated 3 persons, regardless of one person being an infant at the time. It may sound funny but rules are rules and besides, now I'm available to take photos of our family on this cute little train. Welcome to another week of Working Mommy Wednesday, the prompts for this week were inspired by a mid-January article suggesting the 17th to be the most depressing day of the year. 1. What are you doing to stay positive in January? 2. Or what is bothering you this month, making it hard to stay positive? 1. I'm working on a new project that has me super jazzed. I personally get a ton of positive energy from working on exciting projects. It just seeps into every pore and I find myself constantly mulling over ideas and content. 2. I'm in the last trimester of pregnancy - lots of happy hormones keeping me positive and I've had a relatively easy pregnancy so I'm not uncomfortable at all. 3. Happy kids and happy dad at home, they are in a good routine with food, chores and playtime so our home life hums along at a happy pace. Yes there are still the daily hiccups like late dinners, Sam standing on the coffee table and getting in trouble or both kids refusing lunch but these are small things, overall they are good happy kids. I'd love to hear your tips on how to stay positive during winter. Please link up below with your ideas. And even if you are not feeling so positive I'd love to know so I can pray for you! I really enjoyed this article in The Daily Beast, "Consumption makes us Sad? Science says we can be happy with less". The article suggests that happiness with new purchases is fleeting, once we get used to the new object it just becomes another gadget/car/thing in our lives. True happiness is found in DOING. "It seems that most of us get more pleasure out of doing than out of having." "Moreover, we don’t adapt to doing to the same degree that we adapt to having. The museum trip, the hike, the bike ride in the hills, the informal dinner with friends keep satisfying long after the Mercedes has stopped providing a thrill. And a great thing about at least some “doing” is that it doesn’t cost much money. Furthermore, people seem to get an extra shot of well-being juice when they do things that serve others rather than themselves." With Multitude Monday I join hundreds of women in finding JOY by giving thanks for the many gifts in our lives. I tie this together with science in that "DOING" things with my children gives me great JOY and giving thanks for getting to do these things gives me double JOY! 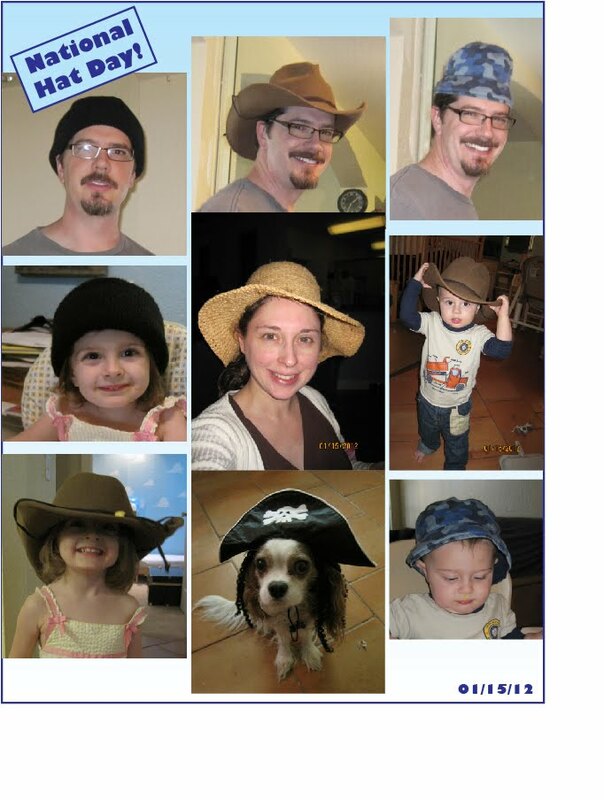 Today is National Hat Day! I don't know where husband finds these days but we all rallied around in support. I spent the day chasing kids with a camera and most of the hats came out blurry. I need a faster camera!! This past week I’m guilty of hitting up Dunkin Donuts 3 days in a row for iced mocha’s (pregnancy craving)! At $3.06 per day I’m feeling a little guilty and compelled to do something about it. The first day of homemade mocha’s I found a hot chocolate packet and just added an espresso shot to the powder + milk. The second day I realized we had no more packets and found the only chocolate in the house to be Hersey’s special dark cocoa. Time for my childhood training to kick in! I recalled how my mom would make hot chocolate on the stove with unsweetened cocoa powder. It’s a little extra work but so worth the effort because it actually tasted better then packets and syrups (and without additives like colors and corn syrup). Stir on stove until it boils for 2 minutes; add 4 cups of milk and heat until serving temperature stirring the entire time. Background – In my Pittsburgh college days, I worked at coffee shops to support myself. Not corporate coffee shops, small tiny shops that taught me how to make really excellent coffee with fresh roasted beans. I learned that unless you want to invest thousands of dollars into a machine that can force hot water through tightly packed fresh roasted, fresh ground espresso in 19 seconds to produce a perfect creama then you might as well settle for a cheap imitation. 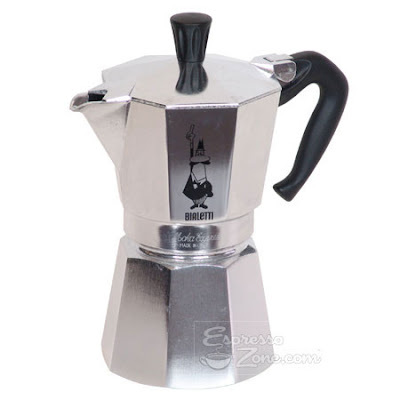 Therefore we’ve settled on the cheapest of all possible espresso makers – this lovely stove top for $24.99. We live in South Florida so there are no lovely coffee shops to be found that roast and sell beans in small quantities so we just buy the store Starbucks bag - I suppose we could order online but then we'd have to pay shipping costs and I'm just not that much of a purist! Back to the mocha part, I add 1/3 espresso coffee to 2/3 chocolate milk and a pile of ice. A homemade Iced Mocha! Cold day outside, for us Floridians. We went to the mall in the morning to play indoors but by late afternoon the kids were itching to play outside. I was on a mission to clean and had made good progress until Charlotte put one hand on my arm and said "can we blow bubbles?" Floors can wait. Dinner is just left overs. 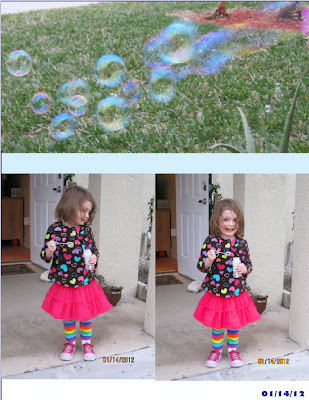 Sure, let's go blow some bubbles! Sam makes his own fun and leads a bear walk back into the house. Seriously, everyone but me bear walked back into the house. Our family has no shame! Do Working Moms Have More Guilt? 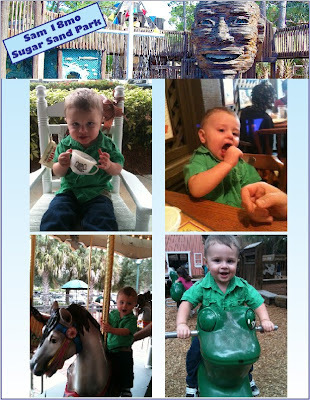 Linking up with Susan DiMickele for Friday's "Working Mom's Devotional"
Question: Do Working Moms Have More Guilt? Recently I’ve been hearing more comments from my stay at home friends that they feel guilty for not balancing as much as I seem to. They call me super mom and seem to feel a little down that they can’t keep up with me. So to answer this question, I guess it depends on the perspective of the individual. My SAHM friends feel guilt for not doing as much, sometimes I feel guilt for not spending more time with my kids. Not really sure who has more guilt. I think we can both have a tendency to pile too much on our plates and wish we had more time for our kids. It’s all about balance and finding the right fit for our families. Just for fun, I googled the question and found a blog dedicated to to working mom's against guilt! It looks like a fun read! 1. What are your "super mom" tips for balancing work and family life? 2. 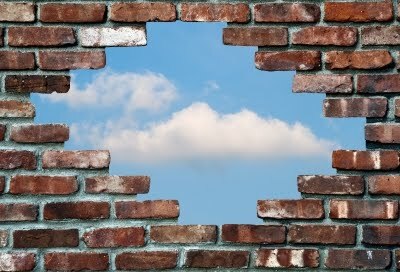 What are some of the biggest challenges you see facing you this year and how do you plan to tackle them? My super tip is meal planning. 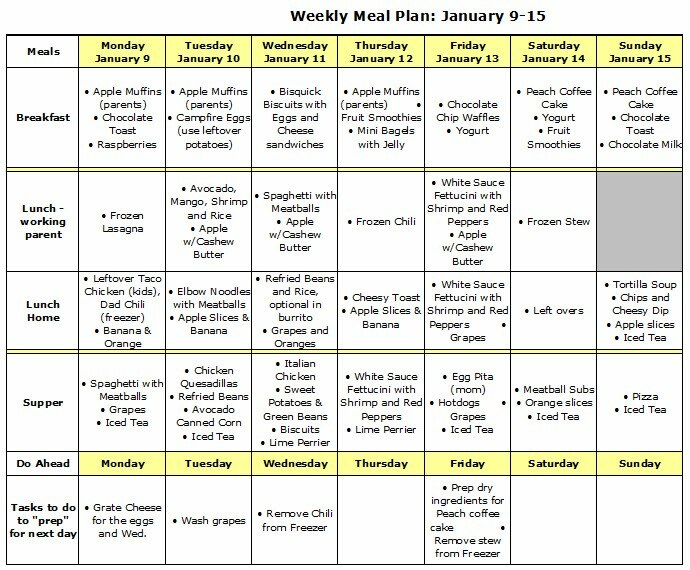 For 2011, I made a meal plan every week for dinners and bought groceries accordingly. To make this job go faster, I made an excel list of all the meals my family enjoys and then once a week I'd select 7 meals from that list. If feeling adventurous then I'd break out the cookbooks and reference a new recipe. If it's a good recipe, then it goes on the list. Provided we stuck to our meal chart, we stayed on budget. After this year of conditioning, we are ready to move to the next step. I discovered The Better Mom's super handy meal chart that plans breakfasts, lunches and dinners!!! She even let's you download her template which I customized to fit our needs. Lately husband and I have been wasting precious morning minutes debating breakfasts and lunches. I realized that by downloading this chart and making the entire week's decisions that we could save time and most importantly stress in the mornings. Leftovers have been promptly eaten, which achieves one of my annual resolutions to not waste food - yeah! Breakfast is on the table faster because there's no discussion! This chart took some effort to prepare and we even did revisions but once it's hanging on the fridge it makes the day go smoother! This works for us, now I'm looking forward to your ideas and blog posts! Link up below and I'll stop by later this week. 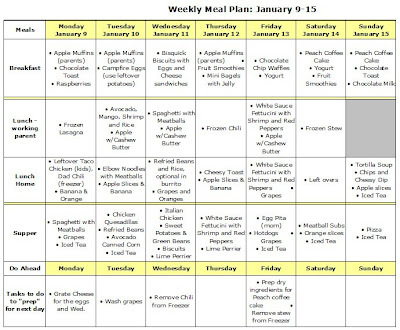 Bi-Weekly Meal Plan - The Better Mom is probably the most organized person I've ever seen with meal planning! Now I plan dinners but never breakfasts AND lunches and for two weeks in advance. Mind blowing and very interesting to read for ideas. You Never Marry the right person - This is a great post for anyone thinking they may have erred at some point in their marriage choice, or if you're just wishing your spouse was a different person. I love the points made that no one is perfect. Do you sleep through the alarm bells in your life - I love this post, such a wake up call to get out of complacency and evaluate what life is really all about. I have a desperate urge to make peanut butter cookies. Have a great random Tuesday!! ps. cold is significantly better, so thankful!!! This past weekend I've come down with my 3rd major cold of this pregnancy. This is unprecedented, my prior two pregnancies were really healthy. I've never been more exhausted in my life so this will be brief but still with a thankful heart. 246 - Halls cough drops, they help a little to clear the nasal passage! 247 - Husband who takes over with the kids so I can take a hot bath on Sunday afternoon to relax and clear out nose. 248 - Spicy food, I can taste it with a cold! In particular spicy chocolate!! 249 - Husband willing to try new things and help me in the process. Today we made Rye Flour Apple Muffins just so I could use up the rye flour in the pantry. Then he raved over them like they were the best thing in the world! 250 - Warm bread with pesto and oil, in the words of my 3 year old "so good"! Last year my husband challenged me to look forward to 2012 as our journey to the promise land. We evaluated our lives and realized we were stuck in a rut, living from one week to the next, meeting our physical needs but not focused on the future for our family. In the little bit I heard, due to being home sick with a cold and rambunctious kids playing while we try to listen to online church, I heard Pastor Bob preach about Christians living in the wilderness because they are too complacent to put in the effort to find the promise land. He challenged us to get out of the world of mediocrity and live in the land of promise. I feel like this goes perfectly with what my husband challenged me to do. Find our way to the promise land. Get out of mediocrity. What does that mean to me? How does one move from wilderness to the promise land? Well it means following God’s call for our lives. 2 Peter 1:10 Therefore brethren, give diligence all the more to make your calling and election sure, for if ye do these things ye shall never fall. Peter is saying to be diligent to discover and find you’re calling in life. Make your election sure by knowing you are saved and ready for life in heaven. If you do these things you will never stumble. There is something that matches the burden in your heart; that is your calling. What is my calling? I believe it’s the voice that speaks to me every Sunday as opportunities are offered over the pulpit to get involved in short term mission trips, 4 Kids of South Florida, Compassion trips, serving in our church and in our community. In the past several years I’ve been struggling with my work schedule and my husband’s schedule. Between us we cover working hours Monday – Saturday, with only Sunday’s off as designated family time. Even though we have small children we want to serve in our community but we cover too many working hours with no family support to help with childcare. I’d love to say I’m satisfied with serving my family but this hunger will not go away. Every week it gets stronger to do more with my life. I might be 26 weeks pregnant with my 3rd child and it be impractical for me to serve at this point in my life, but I can still do the preparatory steps to get our family there in 6 – 12 months. So that’s what we are doing, preparing to move from the wilderness to the promise land. 2012 is our journey of faith. The inspiration keeps coming from bloggers writing about their New Years resolutions. Mary Demuth is hosting a link up for one image to describe our one word focus for this year. Our family word is FREEDOM. My husband and I have some very specific and personal goals regarding debt, finances and happiness. We are not ready to share them as much prayer and preparation is needed but this word and image is the perfect summary. 1. Describe how a company can prove they value you as an employee. 2. New Years Resolutions - share! I've already posted my New Years resolutions on Monday, feel free to scroll down to check them out if you are interested. Today I'm going to talk about how a company can prove they value you as an employee. Value can be proven through monetary means which is important! However, I've found that once salary is settled and I'm in a mid-year routine of coming to work and dealing with stressful situations that other things go a long way to prove I'm valued. 1. This past Monday, first working day of the year, I walked in the door and my boss shouted "come over here and let me give you a hug"! He's a Latin guy, they can be very huggy. It really made my day! It was a cheerful way to start the year and I appreciate being valued enough for a big hug. 2. Last year I got a surprise text on Fathers Day from my boss telling me to take the family out for dinner and bring the check in for reimbursement. It was a surprise and showed value. 3. Even in volunteer work the receiver can show value through thankfulness. 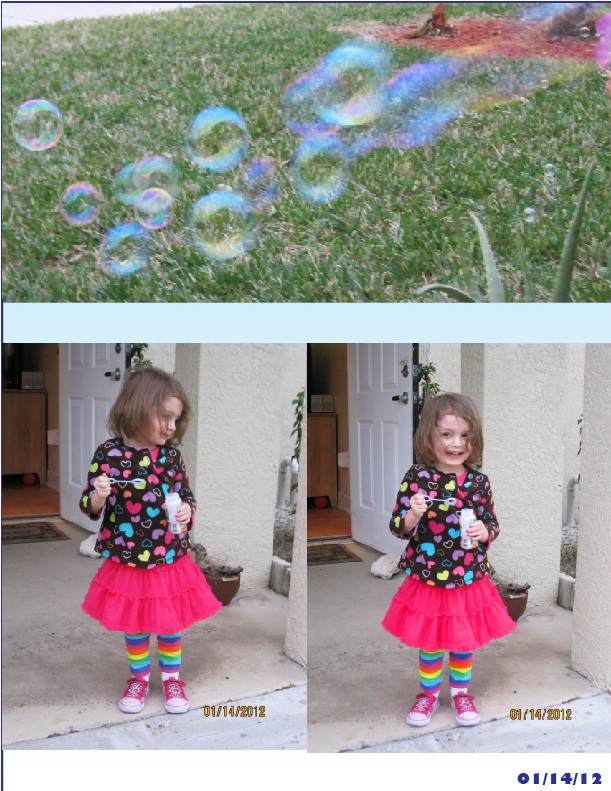 I helped my friend Katrina redesign her blog, The Poorganic Life. I really enjoyed the process of working with her because she is a lovely person with outstanding morals. And I definitely glowed when she repeatedly told me how much she appreciated the work I was doing for her. @rubberbacon sitting in a coffee bar, telling everyone here how amazing you are. You know that right? You are amazing. That last one had me beaming for the rest of the day! I cannot emphasize how much a hug, a surprise gift, pat on the back and words of encouragement can do for the spirit. It takes even a hard worker bee like me and makes me superwoman. So managers, if you want your people to work astoundingly hard for you, give them praise and recognition. They will do miracles for you. 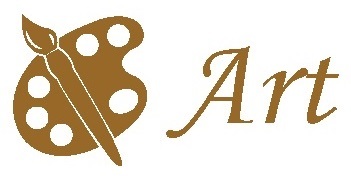 I look forward to reading your stores! Please link up below and I'll stop by later this week. I love how January brings a super high of motivation in writers to express New Year's Resolutions, goals and even single words to declare their intentions for the new year. I've also seen refreshed blogs, announcements of new books and exciting new link-up adventures in the past 2 days! So much creativity in the air!! It's very inspiring. On Sunday I heard a snippet of Calvary Chapel's 2011 New Year's message and it was about Revolutions rather than Resolutions. I thought that was a nice twist on the concept. I won't elaborate, you can gather your own assumptions from what it means to start a revolution in your life. My resolutions are in the post below, sort of a rehash of last years but at least one area I'm still trying to fix! Actually I feel like mine are kinda boring in comparison to all the great posts I've been reading but I don't care, they are my areas to fix and they are important to me. - Now that pumpkin season is over, I've decided to give squash a fighting chance for my love and adoration. Somehow I just assumed it would be more hollow inside, apparently only the ball section has seeds! I won't bore you with the recipe here, if you want it please let me know in the comments and I'll be happy to share. 1st Sunday of the year deserves family time at the beach. In fact, we plan to make 1st Sunday of every month dedicated family day. So often we get caught up by chores that it's nice to have this dedicated time to our kids. It hit me today that it's been 3 months since our last beach day; that's kinda shameful when you think of the longing our friends and families feel towards going to the beach. I'm so thankful that we live in this wonderful environment! 231 - Thankful for having the extra "time" mid-day on a work day to take pre-natal yoga class! 232 - Working in a creative environment is a gift. 235 - Lunch with kids and husband, as a working mom it's rare and wonderful! 236 - Budget for Chick-Fil-A when errands run late and children are tired and hungry. 237 - Enthusiastic kisses from 17mo son. 238 - Watching my daughter run for the playground with a heart for of joy! 239 - A weekend dedicated to my kids! 240 - All the greenery in South Florida, what a beautiful place to live. 241 - Free water to water my house plants (well it's covered by city taxes so it seems free). 242 - My daughter's hair blowing in the beach breeze. 243 - My son's face covered in sand as he explores coral and shell bits. Rest - stop running around like a maniac and cleaning every time the kids nap, rest when they rest. I accomplished 2 out of 3! 1. Rest - I did really good with this one, it was hard to put down the cleaners but I did it and maybe more in part to being pregnant again but at least it's a resolution kept! 2. Food - I'm so disappointed in myself for this one. I'm still throwing away left-overs every week. I think we've gotten better but the fact that we still throw away food makes me very sad. I sat in a conference recently where Shawn Groves, from Compassion, talked about how the poor kids in many areas do not have 3 meals per day, he asked if any of us have left overs and if we do, then to please sponsor a child. Of course I cried and signed up another Compassion child and it stuck with me. Guilt over throwing away food. This is now my only resolution for 2012. I'd like to come back in December and say I'm down to 0 food wastage. Is that even possible??? And while on the subject of food, I'd like to feed my family healthier options. 3. Friends - I have to say I worked really hard at this one in 2011. I'll keep going with it in 2012. If you've made any resolutions, please share them with me. I love reading other people's goals! !